I'd be writing about Deborah Hall even if she didn't say, "WOPN is where the magic happens." 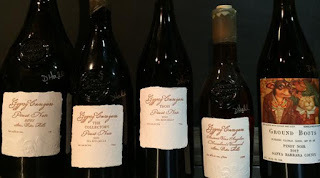 For her winery Gypsy Canyon is a place where magic happens, too, and that's not even talking about her nearly mythic mission grapes/ancient vines Angelica. She makes some of the best Pinot Noir in Sta. Rita Hills, and that's saying something. She gets press like The Wine Advocate to rave, "I came back to this wine often, and was consistently thrilled by what I tasted." Much of that quality comes from keen attention. "I farm organically and live close with the vines," Hall says. "It was only then that I discovered the fragrance of the Pinot Noir flower. It can best be captured on a foggy morning as it hangs lightly in the air. The fragrance is not something I can describe. Just like the wine it can be elusive then surprise you with an experience you’ll never forget. My goal each vintage is to capture this fragrance, this experience, the pure reflective nature of Pinot and bring it to your glass." Those at Saturday's tasting at World of Pinot Noir can reflect on two of Hall's wines. "Our signature Pinot, The Collector’s Pinot Noir 2013, presented in a hand blown bottle with hand made paper label and the cork sealed with estate bees wax" will be one wine, Hall points out. "We select the cream of the crop of the vintage for this bottling." The seocnd taste also exhibits Hall's connection to justice as well as good taste. "My philanthropic project, Ground Boots Pinot Noir 2013," she says, "100% of the profits are donated for animal welfare around the world. Not only do I love the wine, but the label is a treat too; it features art by renowned artist Donald Roller Wilson and prose by Oscar nominated screen writer Alec Sokolow." As one very attuned to her historic vineyard, Hall admits about the past few vintages, "Mother nature being her natural self has created a roller coaster ride in the vineyard with high and low yields and historically early harvests. The vines naturally cope very well. It can be exciting for the optimist, this is after all what creates great vintages. Yet it can pose challenges for the winemaker. I am looking forward to coming out of the drought and the vines finding balance again. Let us all wash our cars and do the rain dance, anything for Pinot!"